The week I spent in the Dominican Republic was one of the greatest experiences in my life. It opened my eyes to see the need of Jesus in every corner of the world, not only in the Dominican Republic but with our neighbors, co-workers and family members. It taught me to love deeper and to see people with the eyes of Christ. While we were there, our team helped lead vacation bible school and begin the ground work for the foundation at the new children’s church in Barahona. It was definitely hot and a lot of hard work but it was worth it. Looking at my pictures and seeing smiles on the children’s faces or thinking ahead in the future of all the lives that will be changed and shaped at the church, I am so thankful for all of the hard work and effort our team put in that week. One of the most precious memories from my trip was church on Sunday night. There was such a sweet spirit in that place as people from different languages, ages and walks of life came together to worship our Savior. Language barriers didn’t stand in the way of our service. I loved the fact that we could worship along with them as they sang in Spanish and they could worship along with us as we sang in English. I kept a journal while I was on the trip and after being home and reading it, I found time and time again that I wrote “I now have a different view of life”; and that is so true. I only spent 8 short days in the Dominican Republic and my life is forever changed because of it. I fell more in love with Jesus, gained many new brothers and sisters in Christ and had my heart stolen by the most adorable children. I came back with pretty pictures and happy stories, but I also came back with a broken heart. It is incredible how quickly and deeply you fall in love with people you can barely communicate with. The hardest part of my trip wasn’t picking up trash, moving rocks, sweating profusely or taking cold showers; the hardest part of my trip was leaving. 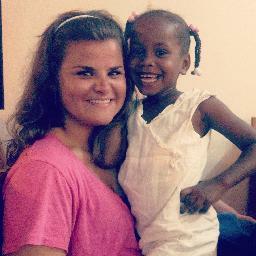 A piece of my heart will forever be in the Dominican Republic.